Teppanyaki vs hibachi: Have you ever been to a restaurant and had such an amazing meal that you excessively tipped the waiter and asked him to ‘give my compliments to the chef’? I have, so many times. Now imagine if the chef himself was standing right in front of you, cooking the food. That would definitely be something, wouldn’t it? The experience just gives ‘dining’ a whole new meaning. Now, one of the most amazing things about the Japanese is that they know what to do with food. They know how to cook it, they know how to make you enjoy eating it, they can even get you to eat raw stuff! (hello, sushi). Another great thing about Japan is her art. Amazing stuff right there. Now imagine this food and art combined together to create a deliciously sensational experience. This is what teppanyaki and hibachi are all about. Cooking, eating, and dining as shown by the Japanese, is more than just preparation of a meal and throwing the said preparation into your mouth. 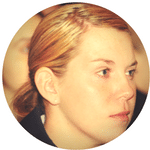 It’s an art that requires precision, care, creativity, and mastery. For the Japanese, the way they cook their food, the ingredients they use, how they serve it, these are just as important (if not more important) than the dish itself. Hibachi and teppanyaki are both cooking styles, very similar and yet very different. Let’s discuss them one after the other. The art of cooking is made up of more than just the ingredients used. It also involves the utensils used, the mode of preparation and the general outlook of the meal when you’re done. This is something the Japanese have been able to perfect, as seen in the teppanyaki. The teppan is a traditional Japanese iron pan, used in cooking. Yaki means to grill, broil or pan-fry. So in the traditional sense, teppanyaki means to ‘grill on an iron plate’, and it also refers to food that is prepared this way. In modern times, however, teppanyaki has grown to involve entertainment and knife skills during meal prep. 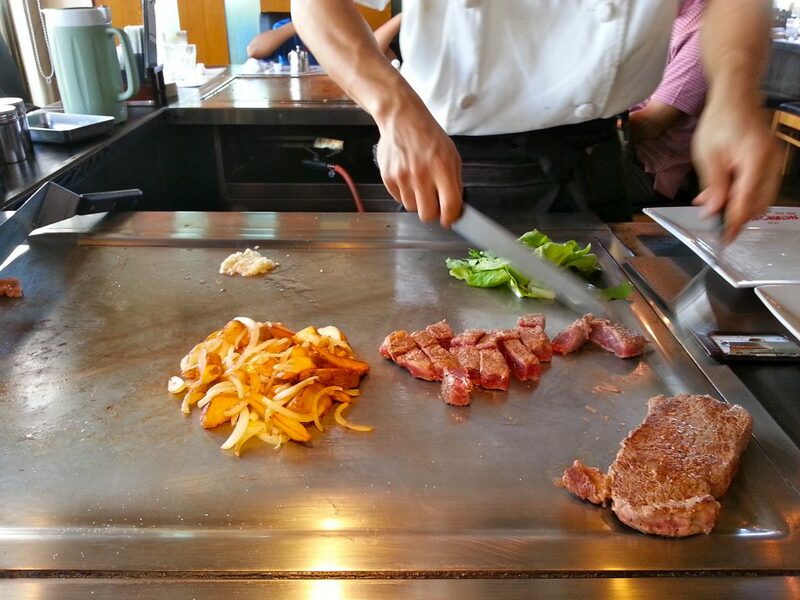 Modern teppanyaki grills are propane heated flat table pans. The teppanyaki style of cooking first began in 1945, while the world was beginning to pick up the pieces after the Second War. It was invented by Shigeji Fujioka who owned a restaurant in downtown Tokyo called Misono. He combined the traditional Japanese teppanyaki grill, with the teppanyaki dishes and some Western dishes and a dash of captivating entertainment. The mixture has proven to be irresistible to this day. Aside from entertaining, the teppanyaki style of meal preparation is very healthy. The dishes cooked this way mostly use fresh ingredients and light seasoning; this is good because it enhances the original flavor of the ingredients rather than cover it up. Some of the seasonings used are wine, soy sauce, salt, pepper, vinegar and garlic, and very little oil (usually soybean oil). The meals cooked vary, but mostly include steak, all kinds of beef, shrimp, scallops, lobster, chicken, and assorted vegetables. The Japanese dishes cooked teppanyaki style include yakisoba (noodles), okonomiyaki (cabbage with sliced meat or seafood) and monjayaki. Side dishes eaten alongside the meal include mung bean sprouts, garlic crisps and fried rice, and in some cases, soy dipping sauce. What is Hibachi? Not Just another cooking style, there’s more to it! 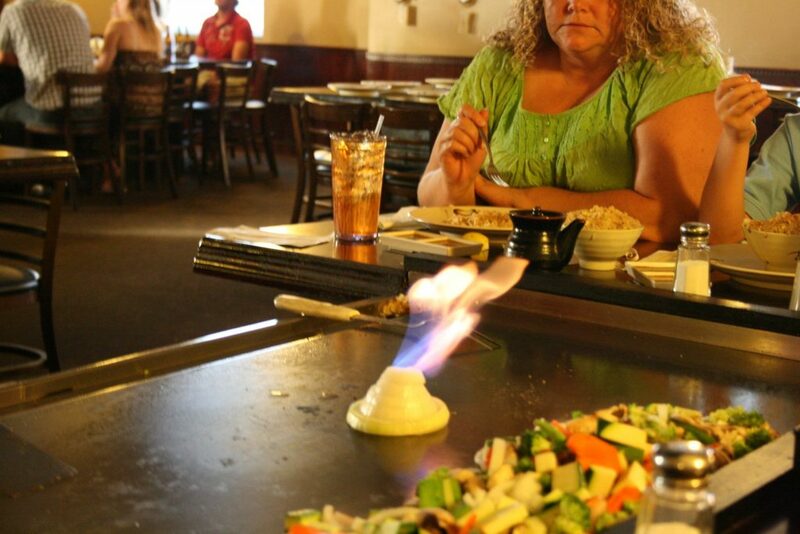 Hibachi is an equal blend of skilled cooking and classic entertainment. 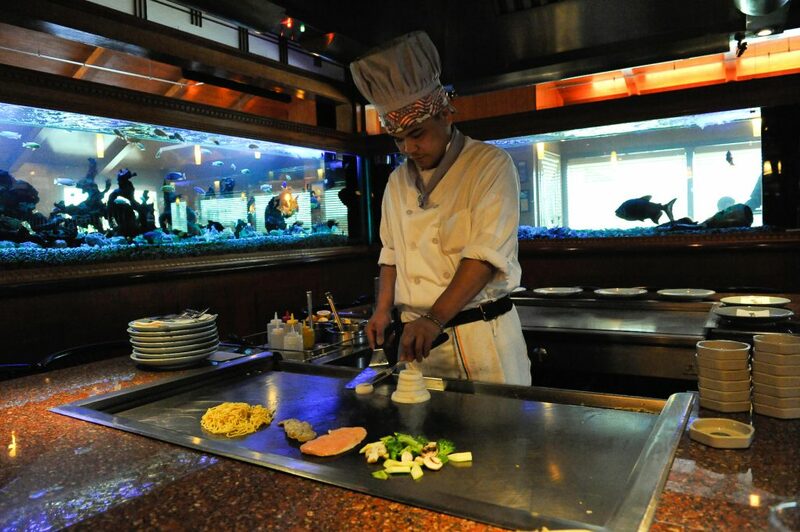 To become a hibachi chef, applicants spend months undergoing specialized training to learn knife tricks, different cooking techniques and ways to entertain their guests. 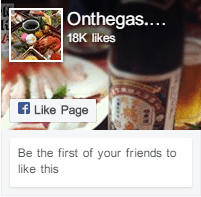 Seems like a lot of trouble for a restaurant, right? Well, it’s not just a restaurant. 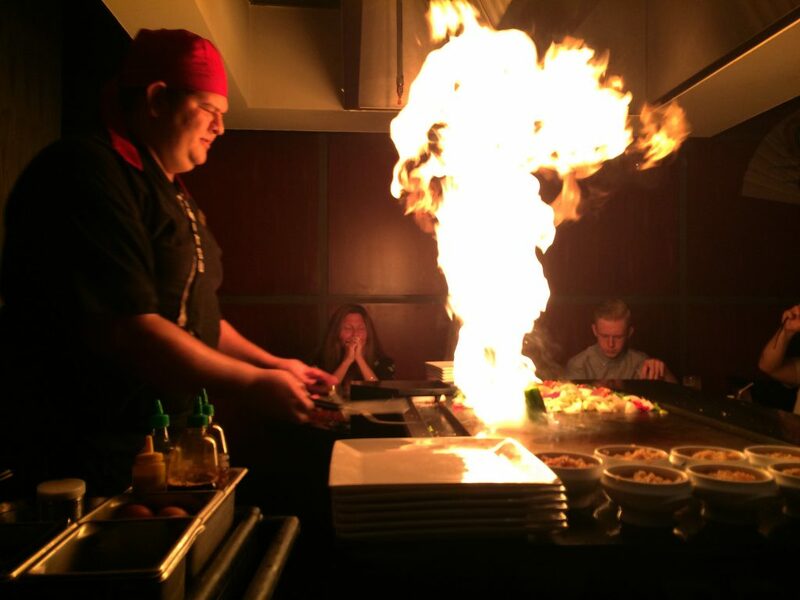 The knife tricks and all the other threats the chefs put on plus the deliciously tantalizing aroma of your food being prepared before your very eyes is what makes the hibachi cooking style or dining experience to die for. The hibachi is a native Japanese heating device. It literally translates to “fire bowl” in English. It could be around, cylindrical or square shaped, an open-topped container made with a heatproof material (or lined with it). It was initially designed to hold charcoal and because of this was used to cook as well as heat stuff up. Since it was so portable, the Samurai warriors way back in that time used to carry it about a lot. Then some upper-class citizens began carrying it too and having it in their homes. And it’s been popular ever since! How Does the Hibachi, Teppanyaki Cooking Work? 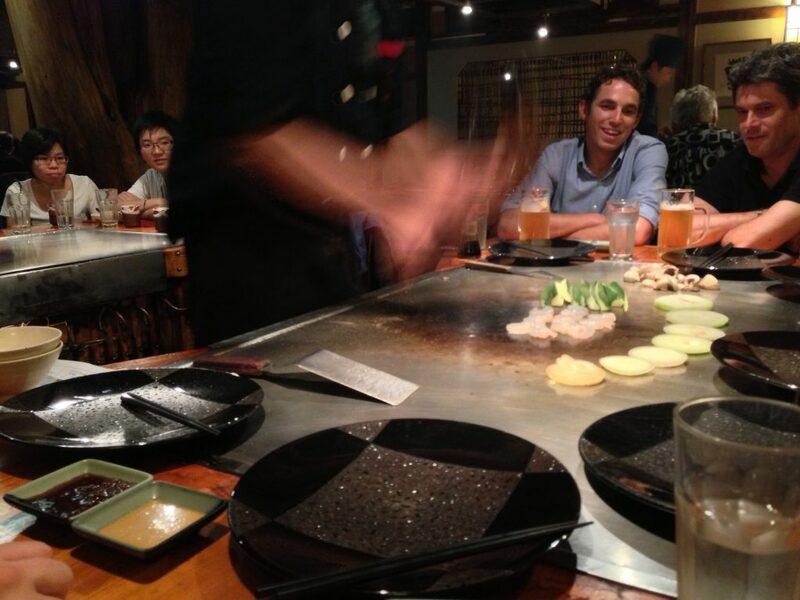 If you’ve never had teppanyaki or hibachi, when you walk into the restaurant for the first time, you might be a lot confused and even scared (for one, you’re very likely to see flames) so I’ve written this guide to help and prepare you for what you’ll see. So when you walk in, you go sit at a table. Except that the table isn’t exactly a table. It’s a grill. So any way you sit around the grill, and the chef comes out. Then you place your order. One of the many good things about hibachi, teppanyaki style cooking is that you can decide exactly how hot, spicy, chill or not you want your meal. You can pick your own sides, toppings, meat, vegetables, and noodles or rice and then sit back and watch as he makes the dish. And there are also vegan options for my vegan folks. Usually, guests are served drinks such as mai tai while they watch. And then the cooking-tainment begins. The chef then begins to stir-fry cook the meal on the grill in front of the guests. He would usually do some knife tricks, and involve the guests in the display. He might toss up a shrimp into his pocket, create a beating heart fried rice, catch an egg in his hat, toss an egg up into the air and split it with his spatula or the ever classic onion volcano. That’s a volcano, people! Made of onions! The kids especially love the onion volcano. The chef continues to cook and entertain, sometimes chatting with the guests during the process. When all the guests have received their orders, the display ends and the chef bows his departure and leaves the guests to enjoy their meal. I know that up to this point, some of you have been scratching your heads trying to figure out the difference between hibachi and teppanyaki, if any. The cooking styles are very similar and they use the same or nearly the same utensils but they are not the same thing. The first difference is the grill itself. The teppanyaki grill is like a table. It’s an iron hot pan or hotplates like surface which serves as both the heating apparatus e.g the stove and the pot. In fact, it is a table grill while the hibachi is more like a bowl. In modern times, however, the hibachi now looks like a barbecue grill with a charcoal or gas flame and is made with an open grate design similar to the ancient fire pot. Because of its surface, the teppanyaki is more suited for grill-frying smaller ingredients like rice, eggs, vegetables while the hibachi is used for more vigorous cooking. Another difference is that teppanyaki is relatively young (1945) and hibachi has been around for hundreds of years. I think the most significant difference is what most people mix up the most. 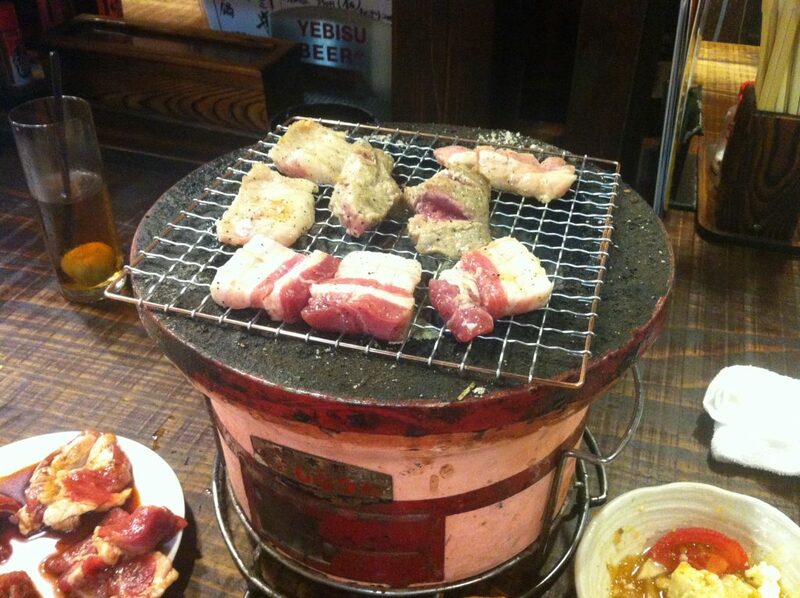 They use the word ‘teppanyaki’ to refer to the grill and the meals. 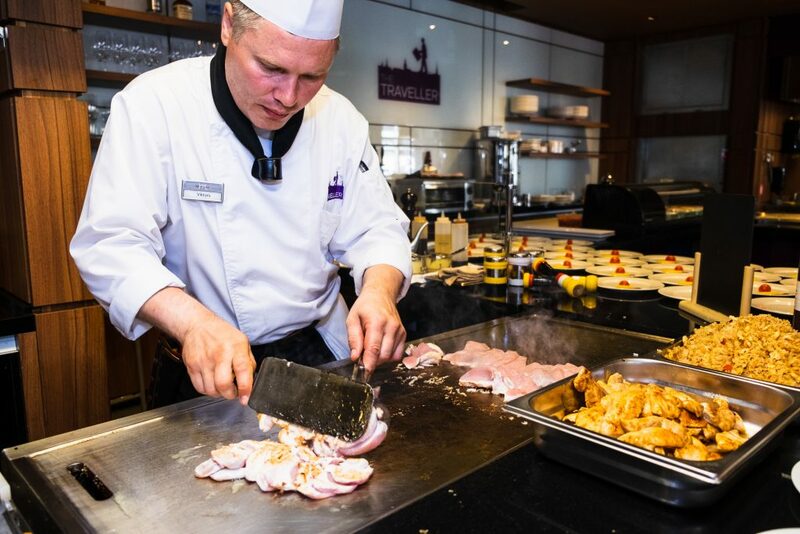 Teppanyaki is a style of cooking, just the way you have deep frying and baking as styles of cooking. We deep fry in a deep pan and bake in an oven. Same way teppanyaki is done using a teppan or iron pan or hotplate. 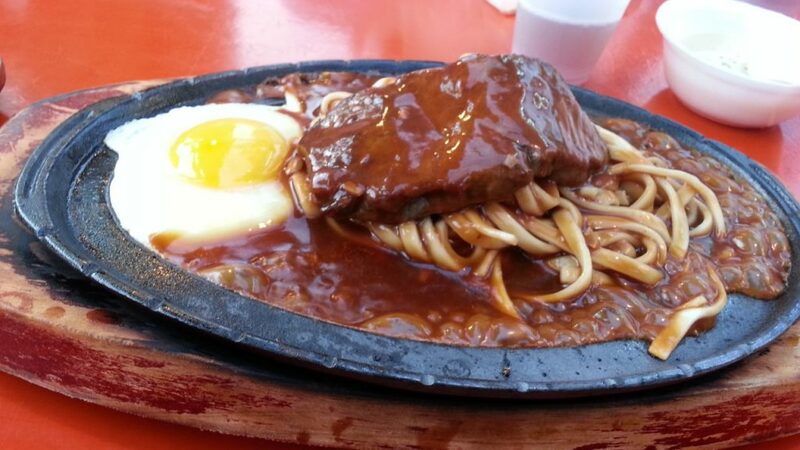 And the food is fried and grilled on this hotplate not in a pan but on the hotplate directly. Not to worry though, it’s usually spotless. While the hibachi is a portable brazier that is powered by charcoal and also used to cook like a stove that you can carry about. Back home in its native Japan, the hibachi is the stove. But these days, especially in the Western world, ‘hibachi’ is used to refer to restaurants that serve dishes teppanyaki style, with the bonus of an entertainment. So you have the teppan grill and the entertaining chef, but the sign outside the restaurant says hibachi. I sincerely hope I’ve been able to clear that up. For a dining experience this great, you can be sure that it’s not your average, everyday kitchen partners that you’ll employ. No, ma’am, you’ll need some extra help. Let’s quickly look at some of the utensils used in teppanyaki and hibachi cooking. Two-time pot fork: this looks like your regular eating fork except that it isn’t and it has just two tines instead of four and it’s also bigger. The beat forks are made from stainless steel and they have a riveted wooden handle. It is used to hold and dish meat, beef, chicken, turkey et cetera. Turners: these look like spatulas but the face is usually wider and flatter than a spatula. It is used to turn food so it can be cooked on the underside but some have edges so sharp they are used to chop or break up pieces of food. The best ones are made of silicone covered metal or nylon. It’s used to prepare foods like hamburgers, bacon, fish, eggs, cookies, potatoes, pancakes and beating heart. The higher the temperature the turner can withstand, the more expensive it is. Grill basting covers: the cover is a dome-shaped apparatus that helps keep the food warm before it is served. It also protects the iron pan top and other kitchen equipments from greasy splashes that may come from eggs, steaks, bacon, burgers, and chicken to keep the grilling area clean. Squeeze bottles: holds the oil(s) used for the cooking. The squeeze bottles are very good because they allow the chef to spray only a small amount of oil at a time and he can control the quantity of oil he is using. Cutting knives: these are super sharp, high speed, brilliant knives used to slice meat, beef and the likes. Now that we know all the utensils used, we’ll have our very own teppanyaki experience. Yes, we’re going to recreate a lot of the recipes (because it’s not just one meal, see) that are popular with teppanyaki. We are going to be using our own teppanyaki table (which is just basically a flat grill on top of an actual table or a wide nonstick skillet if you don’t have a flat grill). You can invite a few friends and family over and wow them with your culinary expertise. Points to note: Different people love different aspects of the meal, but my personal favorite is the yum yum sauce (I guess it’s called that because it’s extra yummy). I usually just toss the whole thing all over my food. It’s that good and can be made with just a few ingredients, only make it a day prior to the day you’ll be needing it (doing this really brings out the flavors). I use two types of oils: sesame and olive. Sesame because the Japanese use it and olive because I like the smell. The sesame oil gives the dish that aroma and taste it has at the restaurant and also goes a long way to add flavor to the meal. Sesame oil is quite thick so you’ll want to use just a little bit. The olive oil is used to grease the grill and pans to prevent burning and sticking (even if your pan is non-stick, this step is still necessary). With the rice, I like to have mine boiled and just sitting in my fridge. Usually, I have boiled rice in my fridge, it helps me when I need to whip up something real quick. Now for the teppanyaki fried rice, having this cool rice is good so that it doesn’t get all mushy when you’re grilling. If you’re not like me and you don’t have boiled white rice already sitting in your fridge, just boil your rice a day before you need it and let it sit in your fridge. Some restaurants add carrots, corn, peas, eggs, sweet onions to their fried rice. You can too, but I’ll make do with eggs, carrots, and onions. Also with the veggies, add as many as you like and you have. Use all favorite vegetables. And for the protein, you can use steak, shrimp, chicken. The cooking method is the same, only that the cooking times differ. And lastly, garlic butter. If you’re not able to find it in your local supermarket, don’t fret because I have a simple recipe for it. The butter is important in this meal, it really takes the flavor of the dish to another realm. Okay, that’s it. Let’s get cooking! The yum yum sauce: be sure to make this at least a day before you need it. Mix all the ingredients together. Add a little water to loosen it up and reach your desired thickness. Put in the refrigerator and chill overnight. The ginger sauce: blend all the ingredients with a food processor or blender. Keep chilled for use. 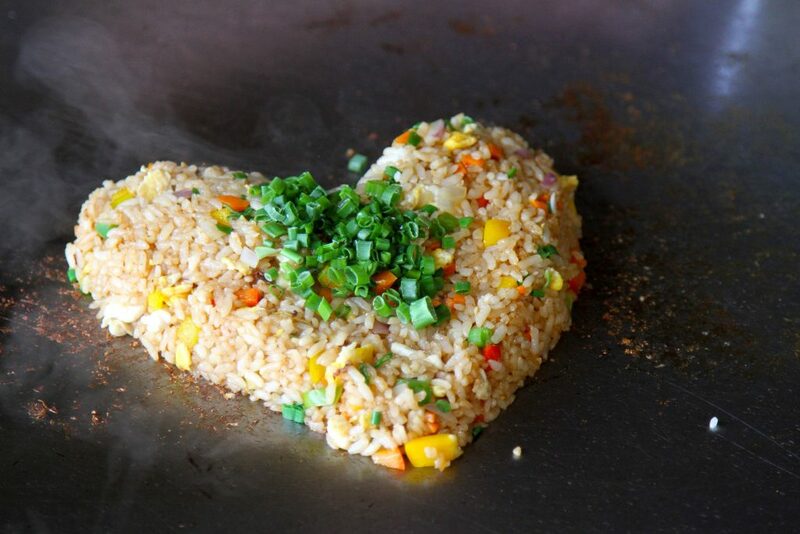 The teppanyaki rice: heat up your oils. Add your onions and sautée for a couple of minutes. And in the egg and scramble it. Once the egg is cooked, add your rice, butter and soy sauce. Mix up the rice and eggs until the rice is warmly heated and it is cooked properly. Add salt and pepper to taste. You can now add your carrots and onions. And serve! The teppanyaki noodles: cook the noodles according to the instructions on the packet and drain well. Heat up the oil. Add in the ingredients with the exception of the green part of the green onions. Mix all the ingredients together. When the noodles are hot and coated, add the green part of the green onions. Add seasonings to your taste. And serve. The teppanyaki vegetables: heat up your oils. Throw in the zucchini, soy sauce, butter and a little water. Sautée for a couple minutes. Add the onions and continue to sautée until all the vegetables are tender. And serve. The steak: heat up the olive oil in your skillet or grill. Add the steak and sprinkle some salt and pepper. Sautée the steak. Once it begins to turn brown, add the remaining ingredients. Continue to cook until the steak is as brown as you like. The chicken: heat up the olive oil. Add in the chicken and all its accompanying ingredients. Cook until the chicken is properly done. The shrimp: heat up your oil. Add in the shrimp. Add the butter, soy sauce and teriyaki. Sautée until the shrimp is cooked but be careful not to overcook it. Add a few drops of lemon juice. The garlic butter: place all the ingredients in a food processor or you can turn it with your hand in a bowl. Be sure to blend or mix it well. Put the butter in a container (so it can take its shape) and refrigerate until it is firm. Wow! We are done. That certainly takes a lot of effort, but it’s worth it in the end. It’s definitely not what you can whip up every day, but it’s great for a kid’s birthday party or maybe an anniversary party. It combines dinner and a show and it’s an open kitchen! What on this good earth could be better? I sincerely hope you can take the time out to make this recipe and enjoy this hibachi vs teppanyaki cooking show. Aji Mirin vs Hon Mirin: What’s the Difference?